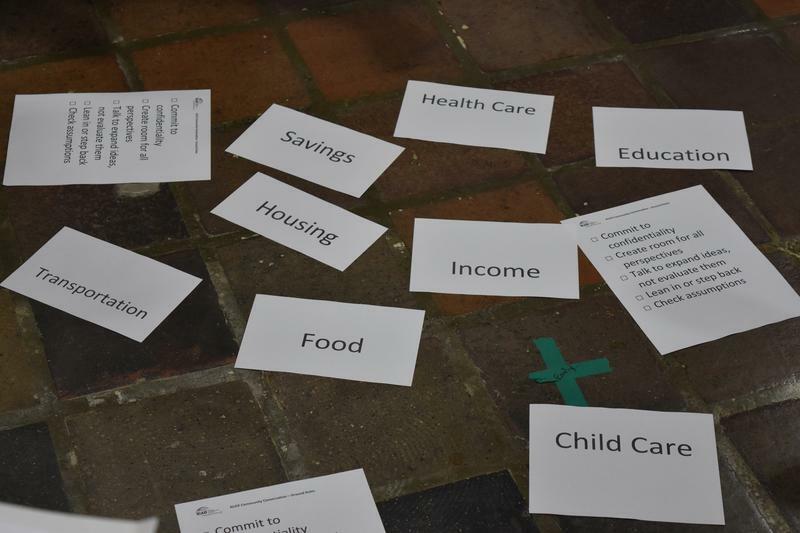 Topic cards are scattered on the floor for groups discussing solutions for ALICE. Laura Toni-Holsinger addresses the audience at the ALICE Community Conversation. 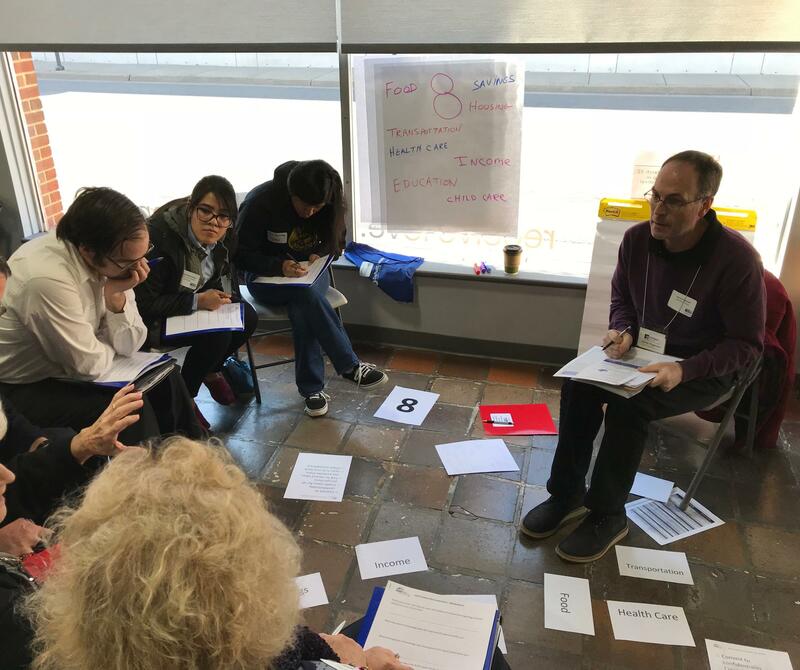 Aaron Hagmaier facilitates a group brainstorming ideas to help the ALICE population in Harrisonburg (Brenda Miramontes is sitting second from the left). The United Way has started discussions with local nonprofits and others to come up with solutions to help those in the Harrisonburg area struggling to make ends meet. WMRA’s Calvin Pynn reports. Community action groups have been putting their heads together to come up with ways to help ALICE. ALICE isn’t a person, but rather the acronym for a group of people in the community. who may be described as Asset Limited, Income Constrained, Employed. It’s a portion of the population that earn an income above the federal poverty level, but less than the basic cost of living in the area. And that means households known as ALICE struggle to afford the bare necessities. In Harrisonburg, 39% of the city’s population falls within the ALICE threshold. The study originated in New Jersey, and soon other states followed. Virginia’s ALICE report was released last year, weighing existing statistics including household incomes, as well as the cost of basic needs such as childcare, housing, transportation, and food. Laura Toni-Holsinger, the executive director for The United Way of Harrisonburg and Rockingham County, said learning about the local ALICE population was an eye opener for her fellow United Way board members, who realized that ALICE individuals were closer than they thought. Those milestones could mean earning a high school diploma or GED, pursuing an advanced degree, moving up professionally, anything that could be seen as moving forward in life. 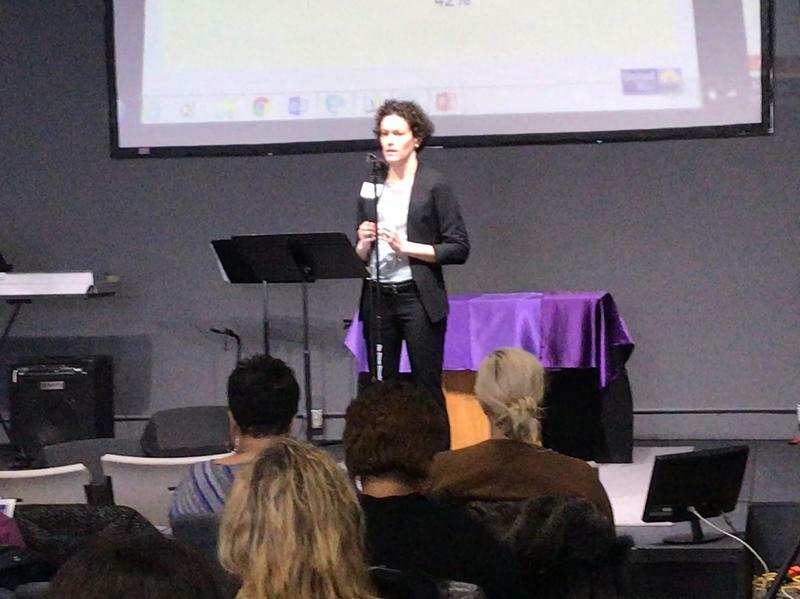 To discuss those options, Toni-Holsinger and other community leaders, local nonprofits, and community volunteers got together to discuss ways to help the ALICE population find those options. TONI-HOLSINGER: You can have some really interesting and creative solutions when you start to have that cross sector conversation. That conversation happened Wednesday morning at the RISE Faith Community Center in downtown Harrisonburg. It included elected officials, members of local nonprofits such as SecondHome, the Fairfield center and students from James Madison and Eastern Mennonite Universities. To generate ideas, the crowd of around 140 people broke into several groups. AARON HAGMAIER: What sticks out in the ALICE report for me is the idea that there is a poverty level that we think about, but that’s not really a living wage. But let’s go ahead, would you like to start first here and share your perspective? Aaron Hagmaier with the Fairfield center helped facilitate one of several groups in the room. With a variety of backgrounds present in each group, whiteboards filled up with suggestions for support programs ranging from child care to home repairs, to mental health. Among the people present were those who count themselves as part of ALICE, including Brenda Miramontes, who is studying social work at Eastern Mennonite University. She said that community acknowledgement of their ALICE neighbors would be the first ideal step to crafting solutions. BRENDA MIRAMONTES: It’s just learning, because one of the people we talked to said that it’s such an invisible issue that nobody’s aware of it, and we want more people to be aware of the situation. A large portion of the ALICE report addresses how a limited household income not only affects individuals and families, but also the community at large. Toni-Holsinger said that with supportive programs in place, easing the distractions caused by financial hardship could mean an overall reduction in stress – not just for the individual, but for the community as well. TONI-HOLSINGER: If we can take that burden off of families, that is huge. Think about how much more productive an employee that would be, how much more engaged that person could be in their child’s school, how much more time they would have to care for an aging parent. When you can take that burden off, people can think about what they want to be thinking about, which is life, work and family. It’s a complicated issue, and so the end of Wednesday’s session marked the beginning of a conversation. The United Way plans to hold more community discussions in the near future, with the next one set tentatively for April 5. More information can be found on the United Way of Harrisonburg and Rockingham County’s website.